Ten Heavyweights. Five Fights. One Night. This Saturday, the UFC will do something it has never done before. The UFC 146 card will be the first Pay Per View to feature solely heavyweight fighters. 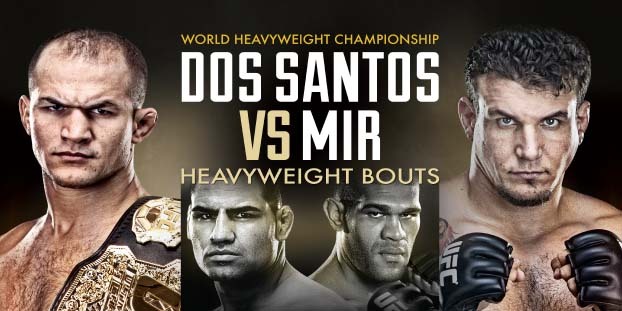 The night is capped of by the Heavyweight Championship bout between Champ Junior Dos Santos and Frank Mir. Mir notably replaced Alistair Overeem after The Reem tested positive for being too awesome compared to the average man. The heavyweight aspect of the card promises slobberknockers and falling-tree knockouts, but it also comes with a caveat or two. With 10 Heavyweights on the card, we have talent ranging from top contenders to middle-tier gatekeepers. With the lower level guys, cardio is always in question, and we could see some sloppy fights early in the card. Let’s just hope that all of the fighters booked Saturday have been Perkisizing properly and they should be ready to go the distance! Johnson is a late replacement for fan favorite Mark Hunt who blew out his knee a few weeks back. Johnson is a nasty brawler that always pleases the crowd, but he may be outmatched against the freakish Stefan Struve. Johnson always will have a puncher’s chance, especially since Struve’s chin has proved to be somewhat suspect over his career. 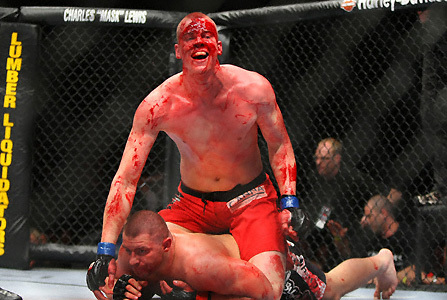 I think Struve will come out victorious on Saturday. Johnson just doesn’t have the ground skills to deal with a 6’10 guy that has already claimed 15 submissions in his career. Struve will use his lanky frame to get Johnson to the ground and force the The Rock look-alike to tap. One of these guys will suffer the first loss of their professional careers on Saturday night. Both fighters prefer to keep things standing; so the loser will also likely not remember his first loss of the career due to a loss of consciousness. Miocic was a big-time college wrestler and baseball player, while Del Rosario is a former WBC Muay Thai World Heavyweight Champ. I have to go with Del Rosario here. Shane is coming back from a car crash that nearly ended his career, so he is tough not to root for. Add in his Norwegian heritage and high level striking, I believe “No Limits” will win this one. The battle of the nicknames in this scrap. Herman is another late replacement due to the Overeem shake-up. 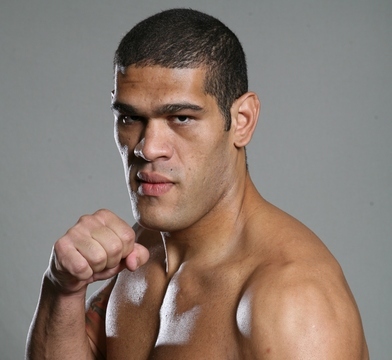 Nelson was first pitted against Bigfoot Silva, then Gabriel Gonzaga, and finally Dave Herman. As each new opponent was named, the challenge for Roy to win also got lower and lower. Herman’s most notable win came against an aging Don Frye in 2009. As long as Roy took his camp seriously (If this is any indication, then he certainly did. 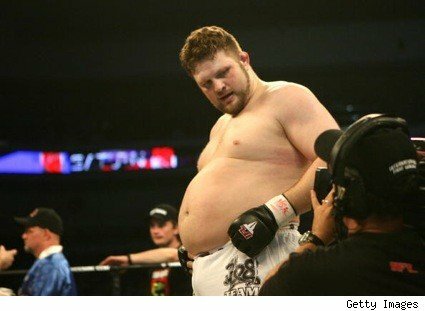 Kung Fu Panda 3 starring Roy Nelson in theatres Summer 2013…) and comes in Saturday in mediocre shape, I expect him to demolish Herman. The winner of this one will likely be the top contender for the next shot at the Heavyweight strap. Due to injuries, Velasquez has been relatively inactive in recent memory. He lost his belt to JDS on the first FOX card and hasn’t seen any action since. Ring-rust could very well be a factor for the American Kickboxing Academy product. Bigfoot Silva enters the cage with a win over Fedor Emelianeno under his belt, something only four men on the planet can hang their hat on. I am unsure what version of Cain Velasquez we will see in the ring Saturday. If it is ‘title-run’ Cain, I expect him to use his lightweight-esque cardio to tire out Silva and eventually earn a TKO. If Cain’s chin is as soft as it looked against JDS, I can see Bigfoot using his massive mits to send Cain to the canvas for an unscheduled nap. For some reason, I do not have a whole lot of faith in Cain on Saturday. I’m looking for Bigfoot to pull off a decision victory here. Most MMA fans out there would have rather seen The Reem vs. JDS in a classic striker’s matchup, but we will have to make due with submission ‘artist’ Frank Mir. Simply put, if the fight stays standing, JDS has a massive advantage and will likely retain. If things end up on the ground, Mir will likely find himself as Heavyweight Champ again. I’ll throw it out there, I really can’t stand Mir and his elitist attitude. After submitting Big Nog, Mir’s already unbearable ego has reached a whole new stratosphere. On the contrary, Dos Santos seems to be the definition of a ‘People’s Champ’. The reaction he gets from fans in his home nation of Brazil is truly passionate and JDS returns the sentiment. The fact that the champ trains alongside kids from the local slums in order to provide them with a legitimate role model and hero is remarkable. Dos Santos even brought one of the kids from his gym to Vegas to watch the fight (as seen in the Primetime special). To maintain the difference between the two fighters, Mir trains in a closed gym so that his own children can run amok while Frank spars with his choice of training partners. Favoritism aside, I think JDS retains his belt at UFC 146. Mir is correct when he says that Dos Santos has never been tested on the ground; though no one has really had the chance to get ‘Cigano’ on the mat. Mostly because he has put his fist through his opponents skull before they could attempt a takedown. Dos Santos has a devastating combination of speed and power for such a big dude. If ‘Cigano’ hits Mir squarely in his smug grill, it could be another short night of work for the champ. Even if Mir gets it to the ground, I am confident that JDS has the skills to defend himself from a submission or get back to his feet. I mean the guy’s mentor is Rodrigo Nogueira, and so what if Mir caught him! Big Nog is still a standing member of the Mount Rushmore of MMA. It would be hard for me to believe that Nog hasn’t dropped JDS a few tips for his bout with Mir, especially concerning the ground game. I look for JDS to beat up Frank standing, eventually catch him with a solid shot and finish up with a TKO. Who do you think will be the Heavyweight Champ at the end of the night? Do you agree with my picks? 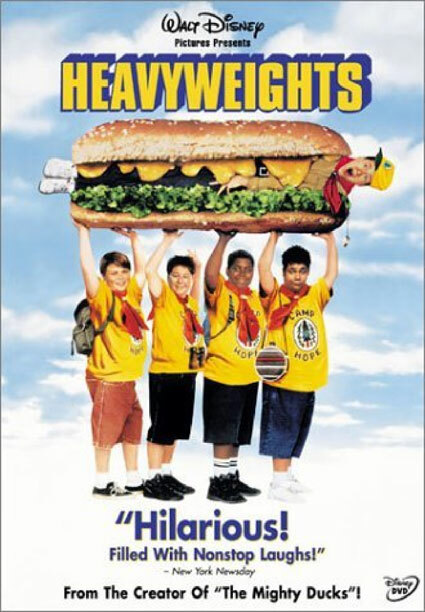 Do you agree that Heavyweights is one of the greatest achievements in American Cinema? Let us know in the comments section! This entry was posted in Commentary, MMA and tagged Alistair Overeem, Frank Mir, Junior Dos Santos, Stefan Struve, UFC, Ultimate Fighting Championship. Bookmark the permalink. 1 Response to UFC 146 Preview: Heavyweights!